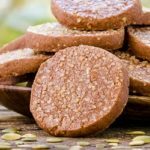 Delightful and crunchy Mexican Chocolate Pepita Shortbread Cookies have a nutty flavor from pumpkin seed kernels and a touch of cinnamon. Toast pepitas by placing them in a large dry skillet over medium heat. Cook, stirring occasionally, about 3 minutes. They will lighten in color and some will pop. Remove pepitas from skillet and cool to room temperature. Grind pepitas in a food processor or spice grinder until coarsely ground. Place chocolate in a bowl over simmering water. Melt, stirring occasionally, until smooth. Transfer chocolate to a large bowl and cool for 3 minutes. Add butter, granulated sugar, vanilla, cinnamon, and salt to chocolate. Beat until thoroughly combined. Whisk together flour and ground pepitas. Add to creamed mixture and beat until just combined. Divide dough in half. Press each half firmly together and shape into a 7-inch log. Wrap logs in parchment paper and chill thoroughly, at least 3 hours or overnight. Preheat oven to 325°F. Line baking sheets with parchment paper or non-stick liners. Cut each log into 20 slices. Place slices 1 inch apart on baking sheets. Whisk egg white and water together. Brush cookies with egg white and sprinkle turbinado sugar or sprinkles on top. Bake cookies for 18 minutes, or until just firm to touch. Cool cookies 5 minutes on baking sheets then transfer to wire rack to cool completely. Time stated does not include cooling pepitas and chilling dough.